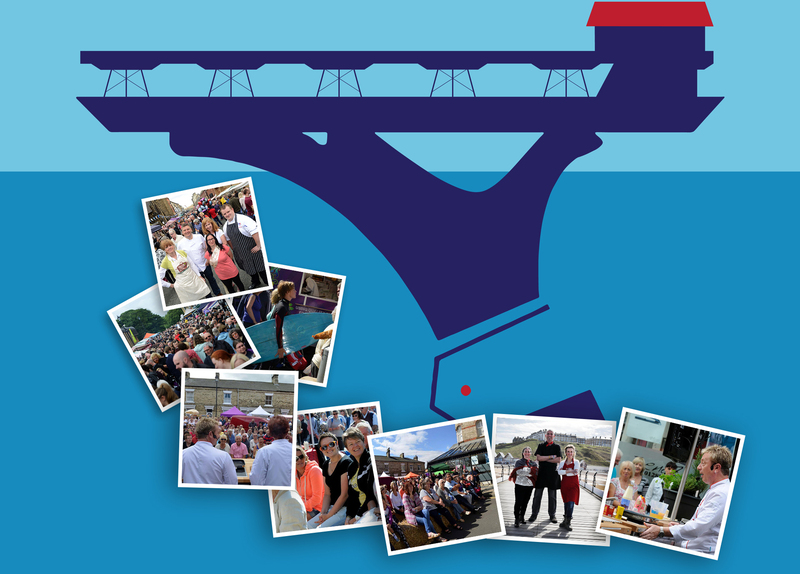 Saltburn Food Festival is an amazing celebration of Northern produced food, drink, craft, its makers and producers. The festival, the monthly market, the beach, the eateries and the towns architecture were all flagged up by the Sunday Times as contributing factors to Saltburn being ‘one of the best places to live in the UK’, and certainly not a food festival to miss! The whole town centre is transformed into a buzzing Festival Village! With visitors enjoying eating, tasting, watching and shopping at over 100 festival stalls – all from the North East of England! We bring good local food right into the heart of the town we’re proud to call home, we also run Saltburn’s popular monthly Farmers Market, held on the second Saturday of the month. The Food Festival is inspired by memories of a family holiday to the historic French wine region of Bergerac on the North Bank of the Dordogne. Sitting at a night market, enjoying amazing local food right there on the street, we loved the sense of community and togetherness around the whole place. We thought there was nothing they were doing in France that we couldn’t do in towns and villages in this country, so we decided to give it a go right here in Saltburn 6 years later we are here getting ready for Saltburn food festival 2019! Street food stalls with flavours that take you on a journey across the globe! Eat at the festival or buy to take home! Anna’s Tapas (Hot & Cold Spanish specials). Armenian Family Street Bar (Armenian street food, flatbreads & Georgian Khachapuri). Café Nobia (Hot African Food). Crispy Conewich (Mexican tortilla cones, with meat or veg filling of your choice). Kettle Corn (Freshly popped pop-corn). Mivesi Café (Hot Bangladeshi food & spice kits). Brati Grill House (Hot smoked lamb & beef patties). Parm Star (Street Parmo’s for festival foodies). Prime Catering (Hot German food). Real Meals (So fresh it just flipped out the sea – The Seafood Shack). Really Indian Ltd (Indian sauces, samosas, bajhis)). Tandoori Naan (Indian Hot Food). The Little Indian (Indian Hot Food). The Little Korean (Hot Korean BBQ). The Velveteen Rabbit Luncheon Club (Cajun food/pies & pastries). The Little Waffle Tuk Tuk (Belgian waffles). Teeside Food (Crazy Teeside themed samosas). Brickyard Bakery (Artisan bread & cakes). Burtree Puddings (Puddings & tray bakes). Cossack Cuisine (Russian sweet & savoury bakery). Puckett’s Pickles (Jams & preserves). The Gingerbread Mam (Homemade Ginger Wine & gingerbread specials). The Jar House (Bakery & Baking Kits). The Waffle Company (Freshly Made and topped Belgian Waffles). Relish (Bakery and Coffe beans). Rosalind’s Larder (Preserves, Italian Cakes & antipasto). Winnie’s Yorkshire Delights (Marmalades & relishes). Arches Cookery School (Oils & cooking essentials). Garth Cottage Herbs (Culinary herbs, garlic and infused oils). The Johnson Brothers (Fresh fruit & veg). Millers (Fresh fruit & veg). Organic Pantry (Organic Juice Bar). Squeezy Rider (Cycle powered smoothies run by Go Tees Valley). The Green Guerrilla (Hot veggie & vegan Specials). Broom Mill Farm (Beef, pork, pies, sausages & more, direct from the farm). Northumbrian Smokehouse (smoked meats, cheese, fish & houmous). Ox Close Traditional Fine Foods (Venison, rabbit & range of wild game from Nth Yorkshire). Pie Jackers (Handmade gourmet pies). The Clucking Pig (Gourmet Scotch Eggs). Gatto Bianco (Rum & Prosecco bar). Lacey’s Cheese (Handmade Cheese from North Yorkshire). Lickerish Tooth Distillery (Gin & Vodka). Orchards of Husthwaite (Artisan ciders, craft beers & locally made liqueurs). Skinningrove Country Wines (Wines from the sun-kissed shores of Skinningrove). Spencerfield Spirits. (Gin & Whisky). Tees Cider (Locally brewed artisan cider). Yorkshire Dales Cheese Company (Cheese). Crafted in Saltburn (Local art & crafts). Plant Preservation Society (Beautifully Potted houseplants). RNLI (Fundraising gift stall for the RNLI). Tinker’s Treasures (Recycled wooden pallet art & silversmith). Coffee & Tea and much more….. The Barista Sisters (Coffee Van). Get set for an incredibly tasty line-up of TV and award-winning chefs taking centre stage right in the heart of town. Your host for the day will put your questions to the chefs and make sure we all know whats going on! What will make your festival? Cocktails on the terrace? Afternoon tea in a gypsy caravan? BBQ by the beach? Party into the night? Street entertainment? Festival visitors can enjoy much more than just good local food. 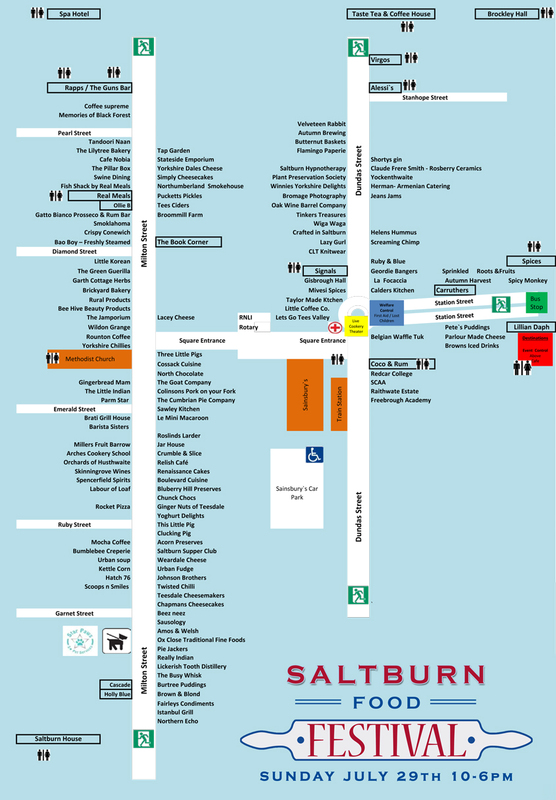 A growing number of Saltburn’s buzzing independent shops and businesses are tucking in to help make a busier than ever Festival Fringe throughout the town centre on the day. Avoid the queues and give the car a day off! There are plenty of alternatives to driving into Saltburn. There will be a ‘Festival Bus’ running from Guisborough Fountain Street Car Park (TS14 6QF) via Gisbrough Hall (TS14 6PT) to Saltburn and back. ‘Festival bus’ direct to Saltburn from ‘Freebrough Academy’, TS12 2SJ. Arriva X4 express Sunday service between Whitby & Redcar calling in at Saltburn every half an hour both directions. In addition, an hourly X4 express runs to and from Middlesbrough. Arriva X3 express service between Redcar and Lingdale, calling in at Saltburn via Marske and Skelton respectively. We love dogs, but the Festival does get very busy and isn’t the ideal environment for your furry friend. Rather than let your dog get stressed, our friends at Star Paws Saltburn are offering doggy daycare and walks so you can enjoy your day and be sure your dog does too. They can collect your dog from the festival, walk them and care for them (and fed if required) for either 2 hours or 4 hours, before being returned to you at the festival. If you just want a short break they will also be offering walks for either 30 minutes or 1 hour. Or, just come to the festival and look for one of the Paw Pals vehicles (parked either end of Milton Street) and ask a member of their staff. And, obviously, please don’t leave your dog in the car. Shortlisted as National Farmers’ Market of the Year in 2014, we continue to bring around 35 of the North East & North Yorkshire’s best independent food producers right into the heart of town on the second Saturday of each month. We’re based on Milton Street, right in the heart of town, literally just 30 seconds walk from the Railway Station.